Written by Yuliya Valko on 01/31/2018. 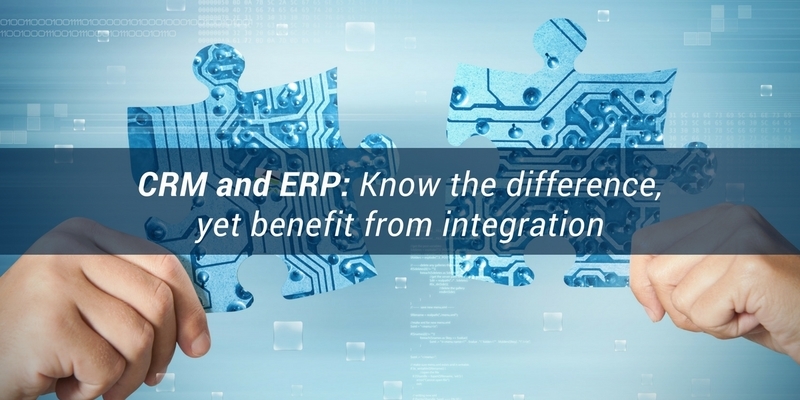 As both ERP and CRM software manage important information for your company, it is critical to have a clear understanding about the functions of these two systems. Let's look at what role each of them plays in improving a company's overall performance. Associations between an account and all related activities, documents, price lists and everything else – from e-mail to contracts. In this way, you have a clear view of all the information connected with the account. Individual form fields which you can use to filter for specific values or use for analytics. Transparency for the team to view the history and have quick access to all elements and data. Ticket system to ensure a highly responsive customer service. Lead management that helps you to follow up on opportunities and don’t lose track of correspondence and progress to close the deal faster. ERP (Enterprise resource planning) is a system that aims at managing the most important business processes with the help of technology. What it essentially does is an automation of certain processes of a company’s everyday operations. ERP enables you to evaluate and manage your supplies, automates the creation of order forms and tracks open orders, incoming deliveries and invoices as well as requests and credit notes. In some cases, it also incorporates tracking the quality and punctuality of deliveries, by integration with barcode scanners, as implemented on the ZeyOS platform. An ERP solution is usually being delivered either as a monolithic application or as a set of integrated applications to collect the data, automate processes and manage a company’s activities. A detailed explanation about integrated solutions is given in the article Integrated IT solutions are Better for Small Businesses. While initially CRM and ERP are two systems with different core functionalities, the main task of software developers is to create a perfect synergy of them that matches a company's needs. Having this in mind we've decided not to focus on some particular set of features but rather studied what are the essential business operations that could benefit from technology. As a result we've developed a business application platform that serves as a single place to run a company's everyday activities. Full view of your customer: Everything from prospecting, to sales and support, to order processing and billing is in one place, that helps to get a better understanding of your customer needs and build a more effective strategy for future interactions. Easy access to real-time data: When you are using an integrated solution, you are able to resolve your customer issues much faster, as everything is connected and up-to-date, available in one place. You no longer need to proactively request specific information about prices, shipments, inventory levels or financials from other colleagues or log into a separate system. It is easily accessible when you need it. Streamlined productivity: Among all other obvious benefits of CRM and ERP integration, the integration simply saves a lot of time by automating workflows and removing the need to duplicate the information. Unified team: Your business operations will run even more smoothly when your ERP and CRM is enhanced with team collaboration tools that are integrated into the same platform. Believing that effective collaboration is a powerful driver to successful accomplishment of any project, we paid a special attention to groupware features on ZeyOS, that provide a transparency on current activities and work progress. As it turns out in practice, it's not the difference between ERP and CRM functions that matters. It's the ability to combine them in one single environment that is aligned with your business goals and provides a smooth handling towards their achievement.